Hmm....3D weddings in the future? Never say never!!! Had enough of the CES barrage? Nah. 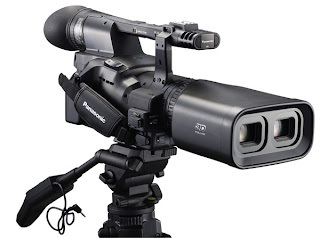 Panasonic just cut loose a few new releases of its own, with the highlight of the bunch being the planet's first integrated Full HD 3D camcorder. Dubbed a "professional" device, the camcorder won't be available to order until April, and it's expected to make the filming of 3D content easier due to having the camcorder itself, the lenses, camera head and a twin memory card recorder smashed together in a single body. Users will also find stereoscopic adjustment controls on the twin-lens, solid state-based system, and we're told that it'll automatically recalibrate itself sans the need for any external equipment. 'Course, the $21,000 MSRP is apt to turn away most everyone not being financed by a movie house, but hey, at least we're fairly certain it'll be reduced to a few bills by 2012. In related news, Panny is also partnering with DirecTV to launch a trio of dedicated 3D channels starting in June, and the two are already in talked with AEG, CBS, Fox Sports, HDNet, MTV, NBC Universal and TBS to develop additional 3D programming that'll debut between 2010 to 2011. Oh, and you'll obviously need a new setup to view said content, and that's where Panny comes in (again). The outfit unleashed a new range of 3D-capable (thanks, RealD!) Viera plasma HDTVs and Blu-ray 3D players, and all it takes to enjoy mind-melting 3D content in the comfort of your abode is "a stylish and lightweight pair of active-shutter glasses." Oh, joy. The complete line will be fleshed out later this Spring, with screen sizes ranging from 50- to 65-inches. In one of the most brilliant moves of the show, Panny's also including just a single set of 3D glasses with its multi-thousand dollar televisions, which is sure to leave a bitter taste in the mouth of Sir Buyer who has to plop down an extra hundie or two to get specs for the whole family. At any rate, the DMP-BDT350 Blu-ray player will handle 1080p content in both the second and third dimension. The last bit is new partnerships with Netflix, Skype, Twitter and Pandora (among other outlets), all of which are being added to the Viera Cast library that's accessible on select Blu-ray players and HDTVs.